Big Village’s Killa Combo is back, with its second instalment of the MC Vs Producer collaborative show. 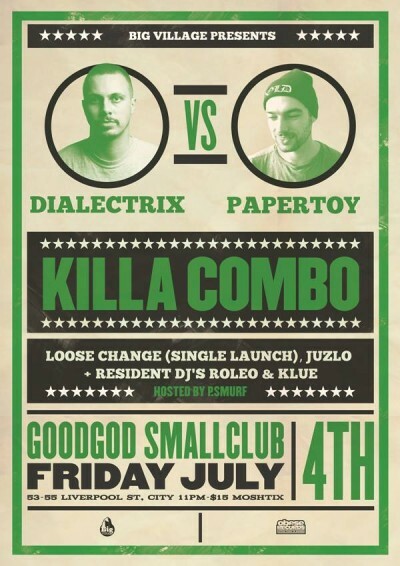 This one off combination of the almighty Dialectrix and the up n coming future flavours of PaperToy is set to shine new light on the diversity and dexterity of each of our performers. Coming together to blend their musical catalogues, just as a DJ would remix a tune, this is set to be a memorable mashup that demands your attention. Expect classics, freestyles, unreleased bangers and the unexpected. Joining them we have the Big Village favorites Loose Change (Ellesquire & Rapaport) who will be launching their new single Yes Or No, taken from their sophomore release Listening Party, ending their national tour with us in Sydney. Closing the night in the early hours we have the grime king of Sydney Juzlo, spinning tunes alongside our resident DJs Roleo (Daily Meds) and Klue (True Vibenation). So if you’re down with big bassy beats, dope raps and grimey good times, don’t miss out on the next chapter of Killa Combo! Big Village presents Killa Kombo, an innovative new club night based on combining a producer/DJ and MC together for a special one off performance. 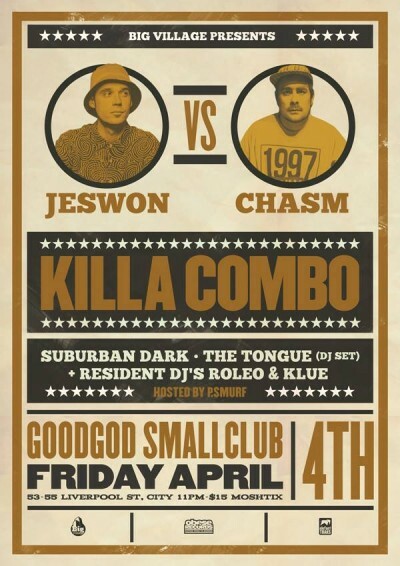 To help kick off the first night in style Jeswon (of the mighty Thundamentals) teams up with Aria award nominated Producer Chasm (Obese/Astronomy Class), to bring you a set like no other. Backed up by Big Village trouble makers Suburban Dark, and DJ sets by The Tongue (Elefant Traks) and resident DJs Roleo (Daily Meds) and Klue (True Vibenation), fans are in for a night of bass heavy hip hop and future beats lightly toasted by some of Sydneyʼs best MCs. Killa Kombo represents something that Sydney label Big Village has stood for since its inception, community. Itʼs music in a collaborative environment minus the egos and the pretense. A chance for fans to hear new artists from our extended hip hop family as well as hang out with other Big Village artists. Chasm is one of the leading Hip Hop producers in Australia having produced and remixed for a whoʼs who of Oz Hip Hop from The Herd, Resin Dogs and Dialectrix to Thundamentals, Urthboy and Skryptcha. Chasmʼs group Astronomy Class also released two albums to much acclaim and saw them nominated for a prestigious ARIA Award. He has also branched out and worked on Dance music under the moniker ʻDr Don-Donʼ pulling influences from Electro, House and Hip Hop music. Jeswon is 1/3 of Thundamentals, one of Australia’s most influential and well respected Hip Hop acts. Well known for his high-energy live performances and thought provoking lyrics Jeswon brings the ruckus to any stage he visits. With a new Thundamentals album on the way and a single ʻSmiles Donʼt Lieʼ which snagged #32 in Triple Jʼs Hottest 100, 2014 has much more in store for Jeswon. So what are you waiting for? Get yourself a ticket and come on down to the Danceteria to witness the combo of all combos! P. Smurf hails from the notorious Daily Meds, and is a part of our favourite Sydney Hip Hop label, Big Village. 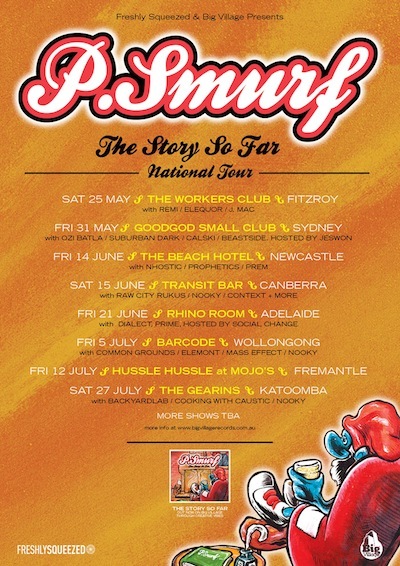 P. Smurf is about to release his debut EP, but until then, has released a free downloadable mixtape featuring collaborations between himself and some of Australia’s finest MC’s and producers. Get your hands on it HERE. Hip Hop trio True Vibenation are all over the map at the moment (literally) and are once more returning to the Small Club. 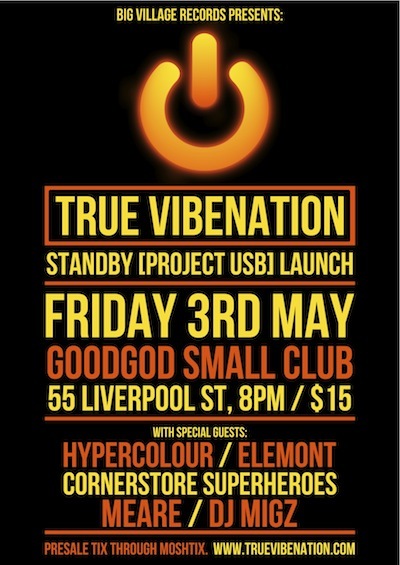 Their new album, Standby, is due for release late 2013 through Hip Hop and Beats kingpin label, Big Village, and to hype the release, the trio are throwing a massive party! Keep your eyes peeled for this project around town!